Every month, a themed MyIrelandBox delivers to the USA, Canada and Australia, the best in Irish Design, Accessories, Home, Natural Beauty, Irish Music, Jewelry, Apparel, Irish culture & tradition galore from Ireland, to your doorstep. 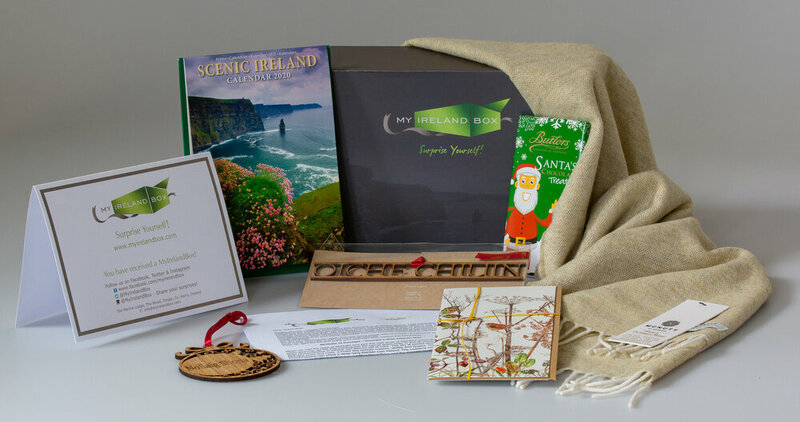 MyIrelandBoxes include full-sized Irish made surprises that are expertly curated by Katharine & her team from Dingle Co. Kerry Ireland, in the heart of Irish tradition and culture. Thank you so much for another year of incredible boxes! So many items to love and cherish. I will never thank and praise you enough for the service you provide. You give us the best of Ireland one month at a time. The crafters you find make items that say Ireland, that are Ireland. This is the next best thing to being there! Getting gifts from where my soul calls home. We look forward to this small piece of Ireland each month. It keeps us connected to our Irish roots …. In our June box we received this beautiful brooch (valued at $200.00) from their monthly drawing for subscribers worldwide. What can I say, the luck of the Irish! LOVED the June box. The raindrop from Connemara brings back great memories of our drive around the peninsula and how our B&B owner would say, "It's a fine soft day, it is," when it was misty raining out. The cookbook looks fabulous and I'm excited to try some of the recipes, too. And the tote is fabulous! You do such an excellent job curating treasures! What ships next? The May MyIrelandBox…and it is SHEEP themed! A Three Month Gift Subscription is a perfect gift for a friend or family member's upcoming birthday or for someone who loves Ireland and that you would like to treat. We are selling out each month, so please do purchase early in to the month of April as all MyIrelandBoxes have sold out before the end of month this year and the May MyIrelandBox will too. Katharine and her team are passionate about Irish tradition and culture and also about everything handmade. We get to share this love with MyIrelandBox subscribers who cannot wait for the postman to deliver their 'hug from Ireland' every month! If you or your friend or family member love Irish sheep, luxury scents of Ireland, books that take you straight to the Emerald Isle, Irish made jewellery and expertly handmade quality craft and home ware with a contemporary Irish twist then you will love MyIrelandBox over the next three months. We choose only the best in Irish design created by the most talented makers in Ireland. ~to a Three Month Subscription that will ensure a delivery of May (Sheep themed), June & July Irish Design MyIrelandBoxes - with a free gift from us for ever new subscription in the May MyIrelandBox. ~ or perhaps you would prefer to pay upfront for a 6 month delivery from Ireland. A free gift worth over $15 USD and also discounts come with the 6 month subscription (the recipient will receive in the post, the May to October MyIrelandBoxes inclusive). Enter your email to be entered in to draws to win a MyIrelandBox of curated Irish Design surprises and to be the first to know about Giveaways and upcoming MyIrelandBoxes.